One of Brontë’s many unsuccessful attempts to be intimidating. If babies had any idea how cute they are, they would work that angle for all it’s worth. With a face like that, a well-timed smile could get people to sign over their cars or houses. Ever seen someone accidentally make a baby laugh by ripping paper or doing some other random thing? It thrills people so much that they will repeat that same action over and over and over again until it quits working with no less enthusiasm than a laboratory chimp banging a lever for cocaine hits. Yet babies seem oblivious to their Incredible Powers of Cuteness. 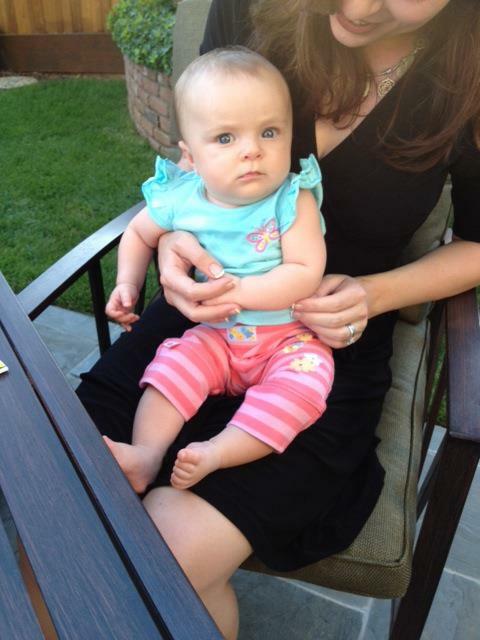 You can tell by the look on Bronte’s face as she sits in my lap in the photo. She is defiant, even territorial. Her face says, “Don’t even THINK of trifling with me. I will MESS YOU UP.” Clearly, she not only means to intimidate but also has utterly no idea how tiny she is. Huggies commercials would have us believe that babies lead a simple life of babbling, crawling, and blue-peeing, but there is so much more going on in those cherubic little heads. Take the photo at the right, for example. This scene is not what it appears. Little babies making friends, you might think… babbling, socializing, mirroring one other. But this is actually a rare snapshot of Brontë’s first heist. See the plastic keys between them? Plastic keys are a very high-value item in baby currency, and the ones in the photo belong to that other kid. 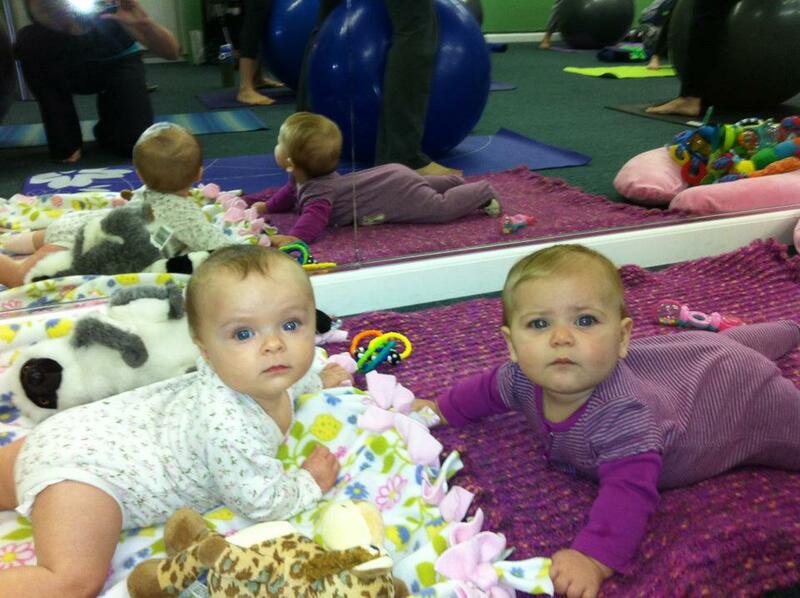 I watched this entire scene unfold while working out in one of those mother-and-baby exercise classes. Brontë, on the left, was given a bunch of fun stuffed animals to play with, but apparently some plastic keys caught her eye. So, she cozies up to the little baby key-owner (let’s call her “Betty”) and starts making cute faces. Brontë takes her right hand and starts wiggling her fingers in Betty’s face while her left hand reaches over to the keys, grabs them, and smoothly slides them under her own blanket. She then continues to play with Betty until Betty gets distracted and turns away, at which point Brontë returns to her blanket, pulls out the stolen keys, and starts playing with them. Really?? If Brontë had just grabbed the keys, right off the bat, I would’ve assumed she is too young to understand the concept of ownership and was just happily responding to primary colors, but this was clearly deliberate. She saw something she wanted and cooked up a plan to steal it, using sleight-of-hand with her finger distraction, and had the wherewithal to put the keys away for later use, only digging into them once the owner had left. This was a multi-step plan. Aren’t babies supposed to have an attention span of about 30 seconds? Watching this play out, I was equal parts impressed and frightened. On the one hand, Brontë’s problem-solving abilities must show great intelligence, but on the other… well, she pulled off a multi-step robbery and is not even six months old. Holy crap! What kind of shenanigans am I in for when she gets older and more cunning?? I guess I will have to tackle that as it happens, and in the meantime, try to raise her well enough that she channels her talents into positive endeavors instead of ending up a mafia godmother. Or drug empire kingpin (queen pin?). 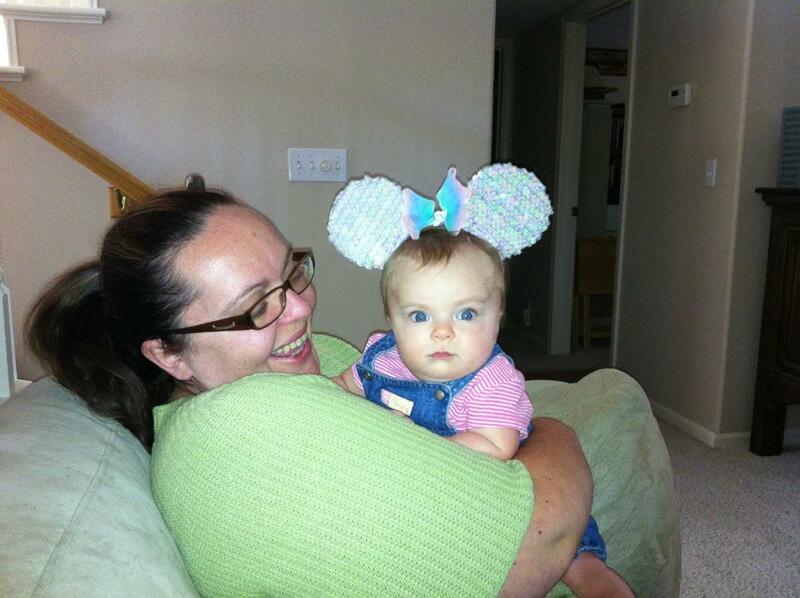 I will leave you with this adorable photo of Brontë’s aunt reveling in the cuteness of a baby with mouse ears. Brontë, on the other hand, felt the overalls and mouse ears were not doing much to bolster her “street-smart” image. HAHA I love it. My son used to like to do the “I am going to be cute to distract you while I am really taking something I want” move too. It is nuts to watch that cognitive process. Totally. It’s all really neat when you see them start to think things are funny on their own. That is such a great observation, that if they knew the power of their good looks they would exploit it so much more, but thankfully they don’t know the power or they would be unstoppable. Has to be some way to keep them in check. Which keeps a balance in the force.